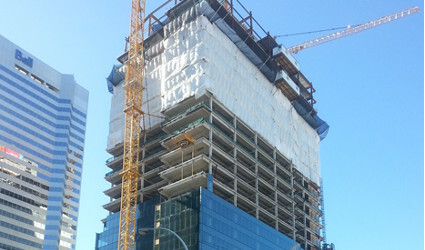 A 30 Storey High Rise in Downtown Edmonton opposite the new Edmonton Arena. Foundations laid out for Structural Steel, followed by “real time” alignment and then as builts for final location of installed steel – repeat for podium and Thirty Floors later you arrive at the penthouse and plant rooms. Glazing layout for whole of podium area and 30 storeys. With minimal scope for error, this layout covers the whole of the building providing line (alignment) location and elevation for each vertical component throughout these Towers. Not just square boxes - the geometry. Block D – the North and South Elevations slope outwards as the building rises from the bottom and then they slope back in at the top – a bit like a sail. The interesting thing is that the slope changes (ever so slightly) every two floors (just to keep you on your toes). You’d have to look really close to see the individual slope changes but when complete, the overall effect is inspiring.